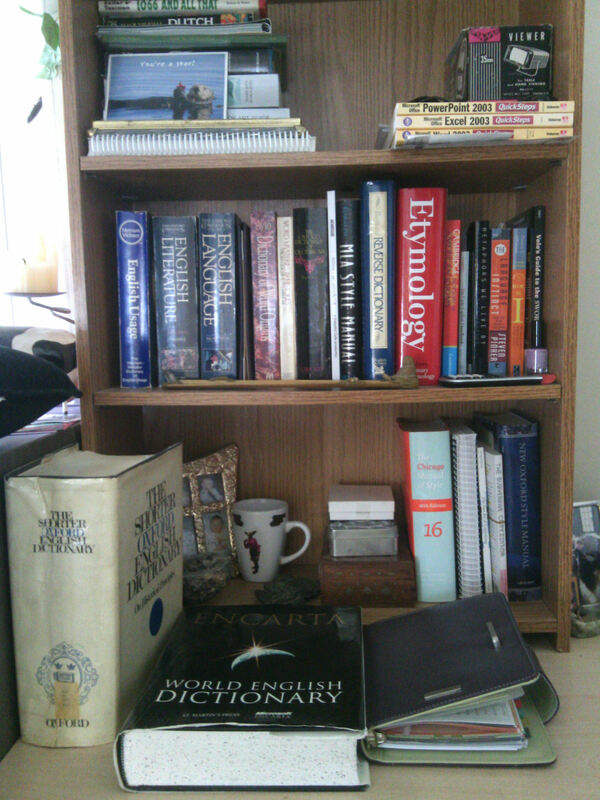 A look at my bookshelf – Grammargeddon! Sometimes people ask me which books I use for my work. I figure everyone knows by now that I’m a Chicago Manual of Style 16th edition kinda gal when it comes to style, but what about other books? I also have copies on my shelves of the New Oxford Style Manual (for UK usage), the Merriam-Webster Dictionary of English Usage, the Oxford Companion to the English Language, Chambers Dictionary of Etymology, and the Cambridge Dictionary of American Idioms. Oh, and I also have that 2012 edition of the AP style manual for the day job. My copy of the MLA style guide is one edition behind, and I’ve never had cause to use it, but I keep it around anyway. One never knows when one might need it. If I end up editing something that requires the current version, I can get help at the Purdue OWL site. Here’s a photo for you to peruse at your leisure. I like having my reference books within arm’s reach; this sits on top of my desk, to my left. Usually there’s a cat blocking the bottom shelf. All of this is within arm’s reach, just to the left of my workspace. Less or fewer? Can you count? It is. And it looks mostly normal, right? Doesn’t it look mostly normal? I don’t see the cat, either! That’s because he’s not smiling. I solemnly swear that I am up to no good. I also solemnly swear that I am NOT human. You asked us to leave comments for troubleshooting purposes. I have such reference envy seeing this bookshelf. I have had many of these in a prior life but finances and a long developed aversion to accumulating stuff keeps me without. Sadness. Now, lets see if I can post this comment. And I see that your cat is much better at going invisible than mine.